In this article I will demonstrate how to add a local shared drive to your Trust center which will facilitate developing basic Add-In functionality locally. This will not works for Add-Ins which require internet access (c:\local cannot call https) but for testing out your Word API skills this is perfect. Taking from the example (which you should read first) I am going to modify the section about adding a trust center with an example. Using that I was then able to run the example code. There were a couple of warning though to accept to get this to work. 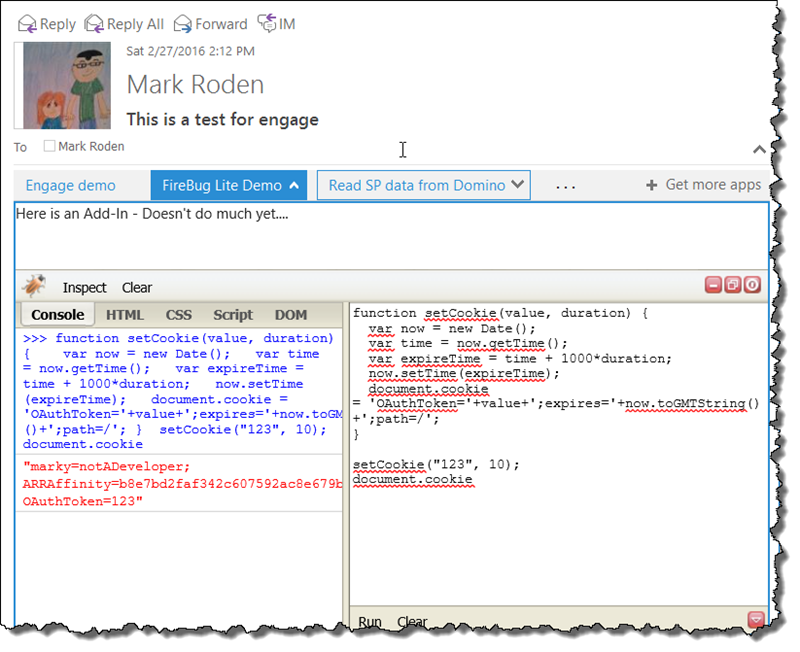 There we have it – the locally hosted example working. 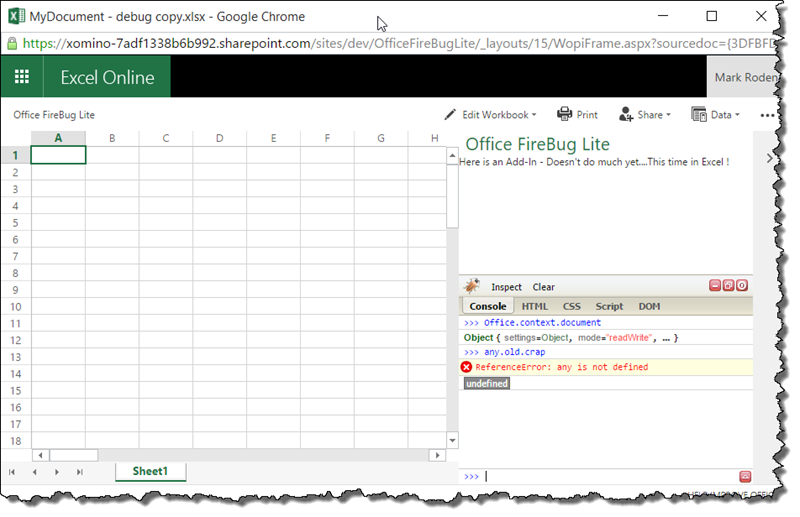 Using the technique to add firebuglite to the Add-In I was then able to start to copy an paste example code from Microsoft examples and start to learn the Word API and its nuances. 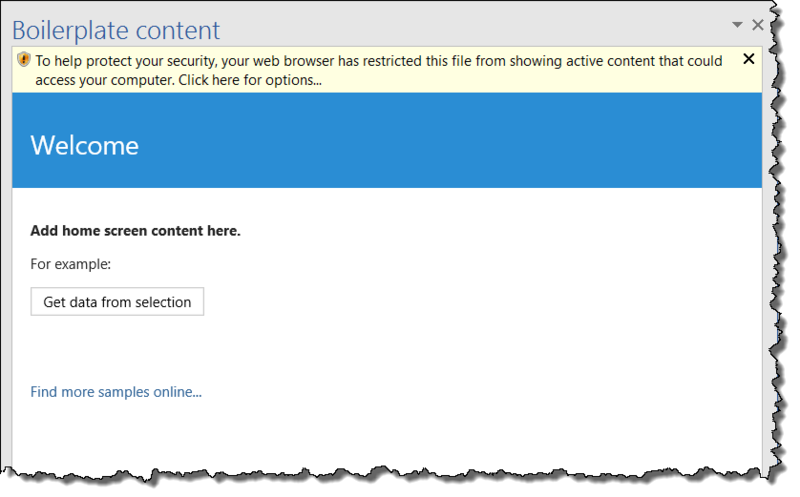 In this article I will demonstrate some of the limitations of Internet Explorer’s cookie handling and how we need to architect out Office Add-Ins to prevent overload thereof. 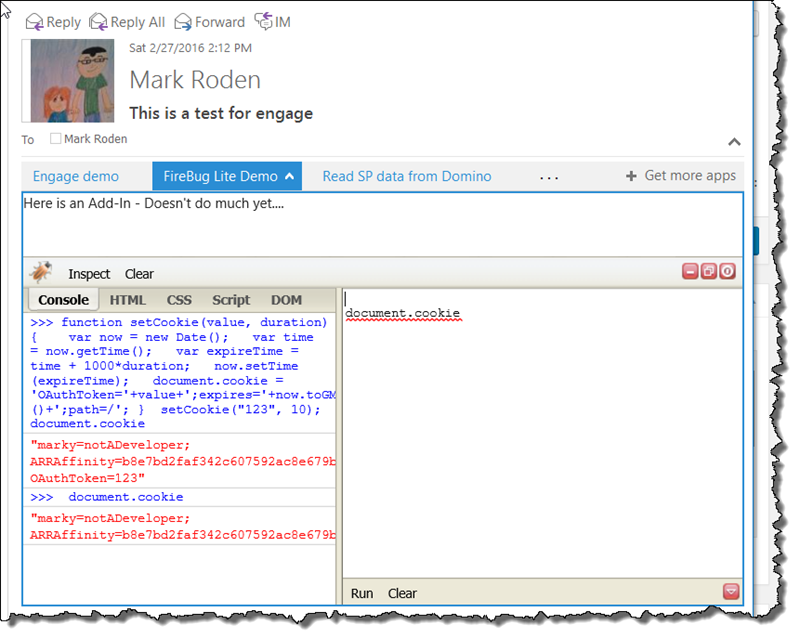 In a previous article I demonstrated how we could cache data within an O365 Add-In using document.cookie. The logical extension of this would be to use it to cache OAuth tokens from Azure AD. In that way users would not have to re-authorize every time then opened the Add-In. 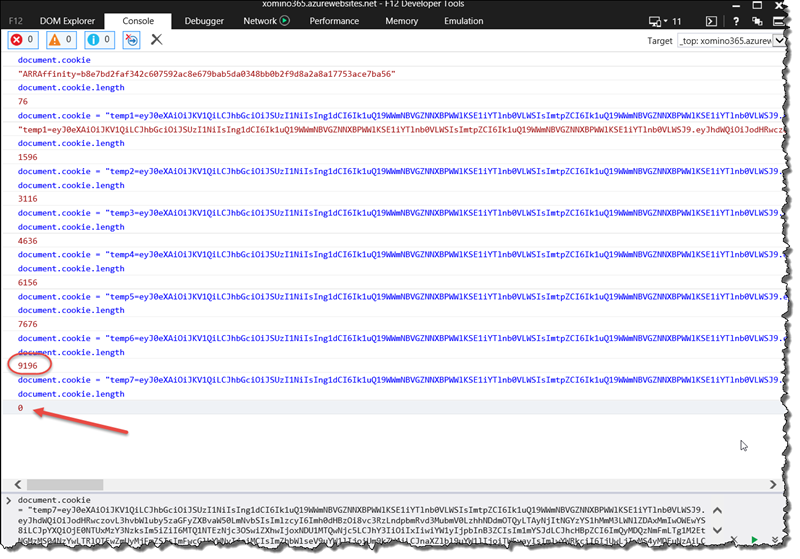 An OAuth token in the O365 environment is typically around 1500 characters in length ! In Internet Explorer there is a finite limit to the total size of the cookies on any one page. Those cookies are built up of all the cookies valid for that path. We can easily demonstrate how to blow this up by successively adding more and more data to a cookie as you can see below. As we add the same OAuth token over and over again we successively increase the length of the cookie until we cross 10,000 bytes and it blows up to zero. The implications of this are stark; if we cache an OAuth token for more than six O365 Add-Ins (even if they all get a different name) in the same path, we could destroy all of them without the user even knowing. This is not acceptable and we need a more elegant solution. When creating a cookie, the path is an optional variable and if it is not added the “path” it defaults to the current location. In the following example we set a cookie in one directory, and it is unavailable in the second directory. Although this is probably not a significant issue in the wild (because most people are not going to put all their Add-Ins in the same folder for deployment), it is something good to be aware of. There is a finite limit to the size of any single cookie in Internet Explorer, don’t blow it. 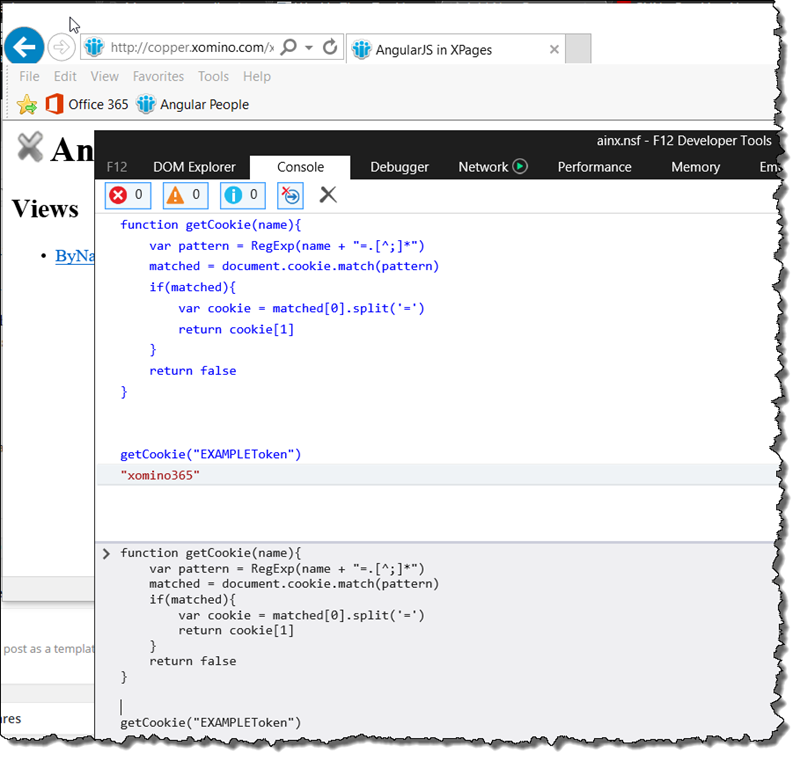 In this article I will highlight an issue you may come across when you are trying to deploy an Office Add-In pulling data from a different domain. 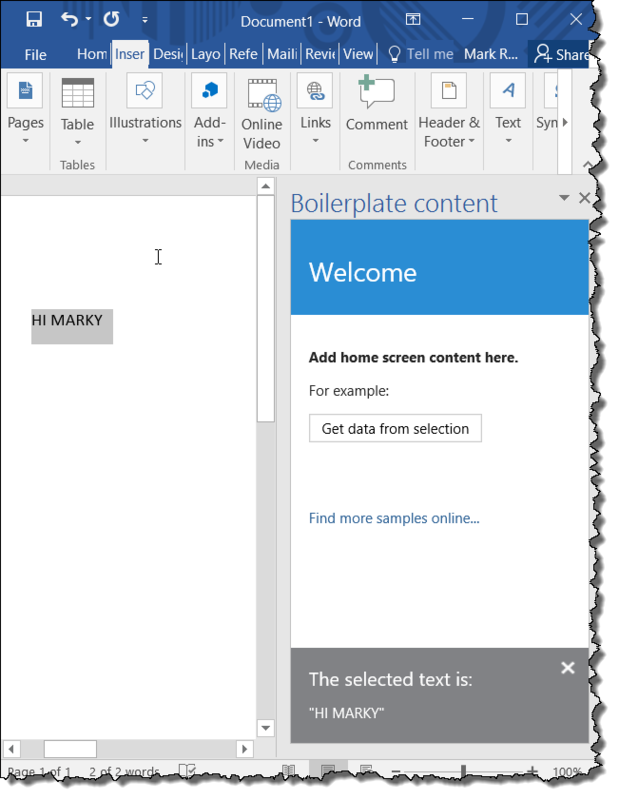 As my adventure into Office Add-Ins has continued I began to look at integrating data from outside of the O365 environment, into Office Add-Ins. 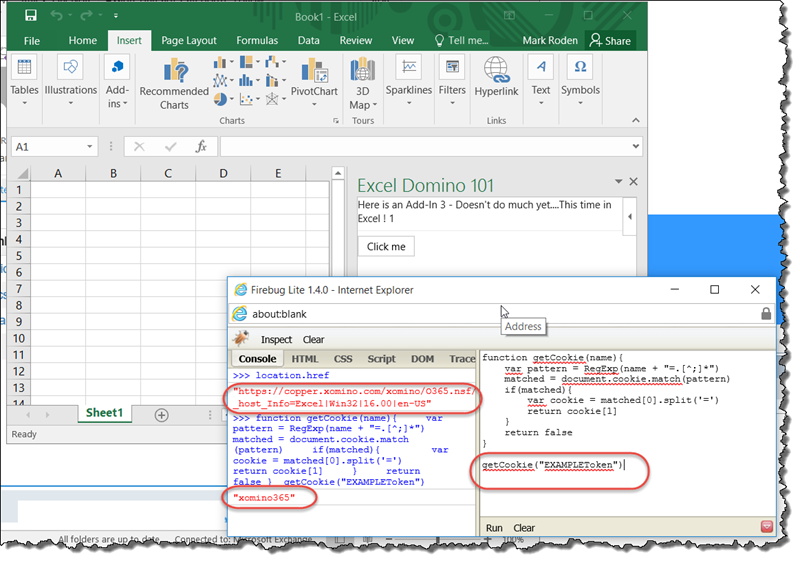 In this example specifically pulling data from an external source into an Excel spreadsheet. 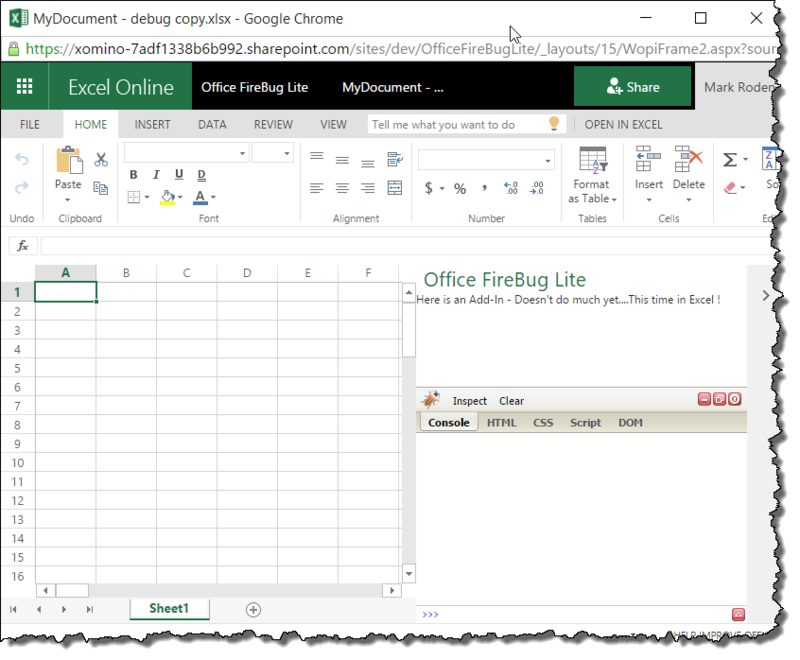 I followed the example code from the Build your first Excel add-in site and as I showed in the Firebug Lite post I was able to take the example code and make it work in an Add-In. I then wanted to prove to myself that I could pull it from a real data source. But every time I ran the code I had an error which told me that the data could not be pulled from copper. For the life of me I could not figure out how until I came across a post on stackoverflow (which I cant find to reference now) which pointed me in the direction of IE security settings. 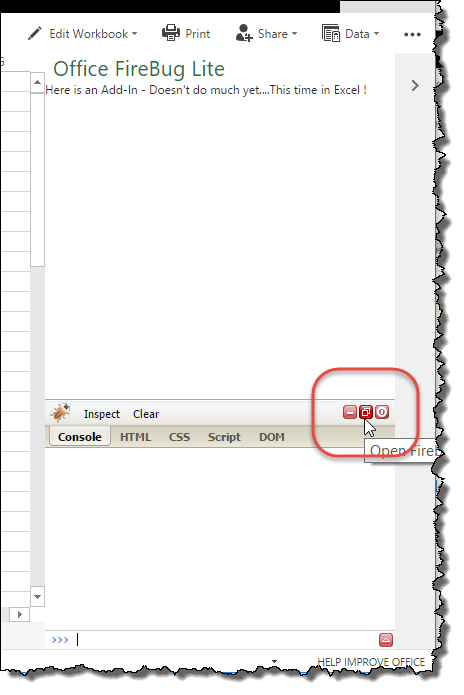 By Default CORS is turned off in Internet Explorer ! This is a setting which goes WAY back to the start of Cross Site Scripting issues and way before CORS itself was even a standard. This was actually something Microsoft did right with old IE ! 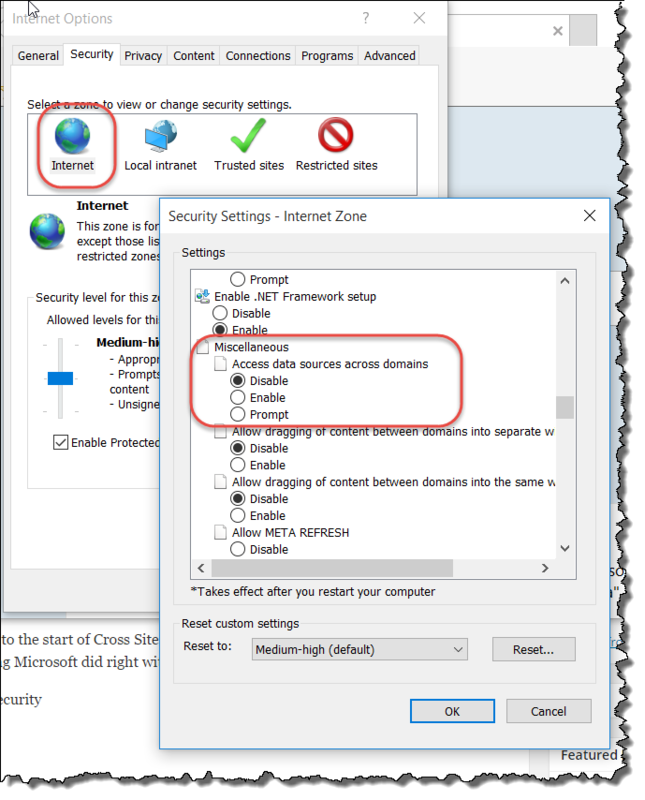 If you go to Tool – Internet options – Security and look inside the Custom Settings option for Internet sites you will find that accessing data across domains is Disabled! So CORS isn;t even an options – cross domain data retrieval is off. You can change this for Internet sites in IE10 or IE11 because both of those browsers have CORS built in to protect you – not so much in IE9. In a business environment though you should be using Trusted Sites. If your Add-In HOST website (www.napacloudapp.com in my case) is added to Trusted Sites then the Access data across domain options is set to “Enable” and the problem is fixed. This was something I first encountered way way back over 10 years ago when I was messing with XML Islands back in IE5 ! I knew it was there but had never really though about it in this context. Because the client based Add-In experience is basically an embedded Internet Explorer instance, all the browser settings are carried into the experience with it. 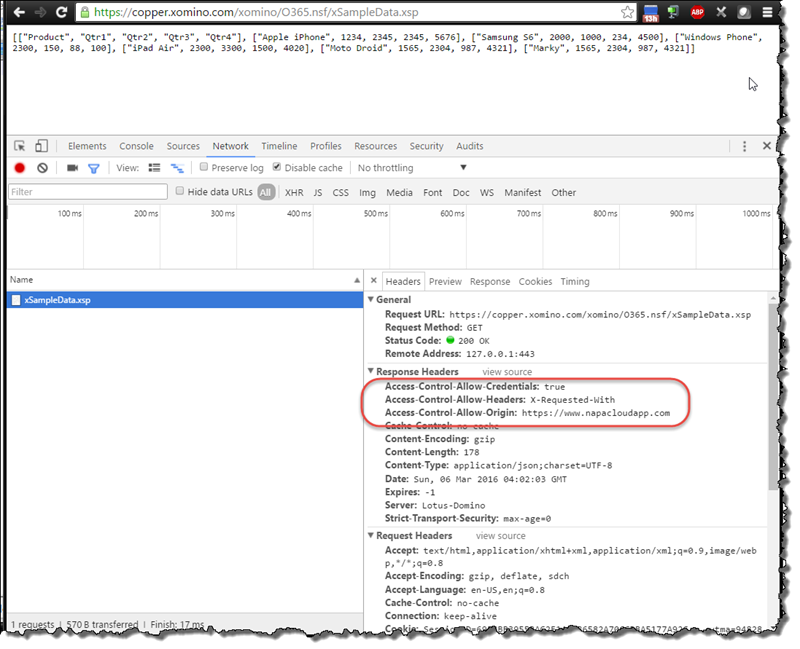 In the previous article we looked at how we are able to cache data within an Office Add-In using the browser’s document.cookie capability. In this article I will demonstrate how flexible this capability is and how it will even work across different Add-Ins and different applications. Cookies can be created and be stored within a specific domain/path and this is critical for this example to work. If you do not add a path variable to the cookie when creating it, it will not be available outside of the specific URL from whence it was created. What this means for us though is that we are able to create a cookie from one Add-In (URL Host) and as long as it is in the same domain, we can access that cookie value in another. 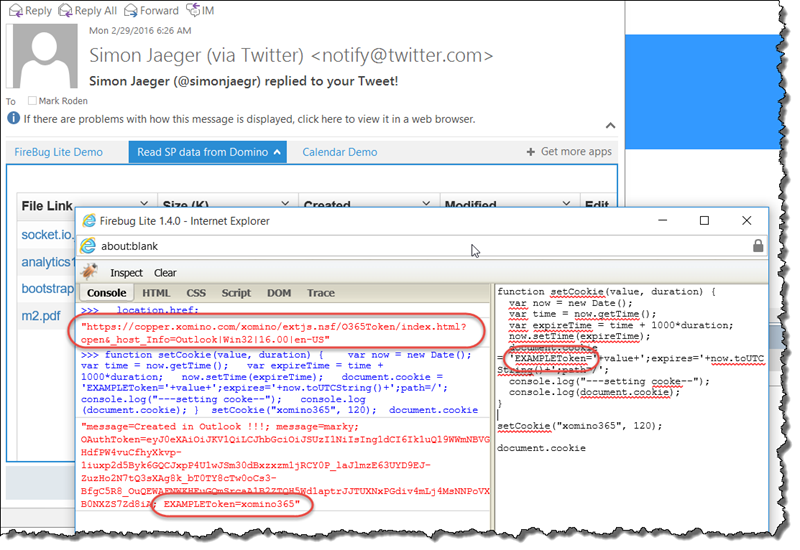 In the example below we are setting the cookie in the Outlook Add-in. The location.href (which is the host page for the Add-In) is https://copper.xomino.com/xomino/extjs.nsf/O365Token/index.html. 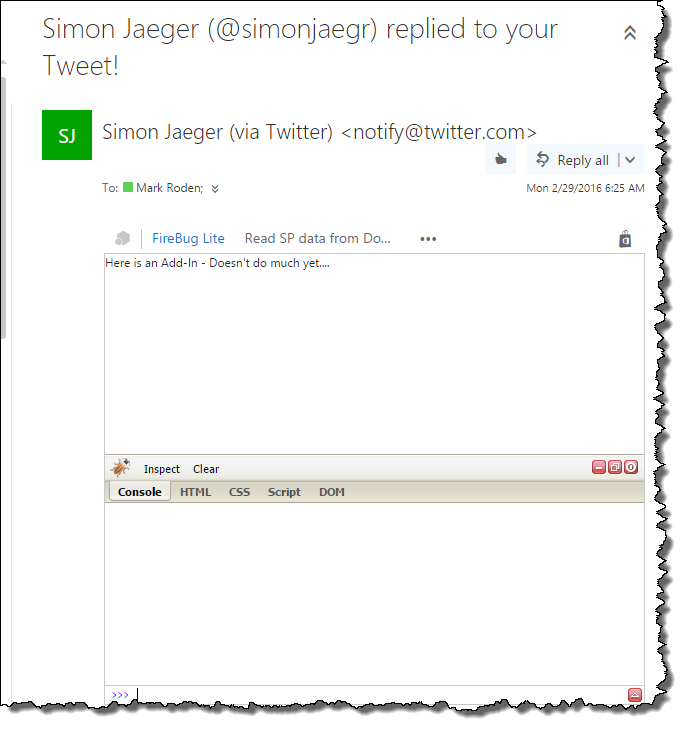 You can see from the Firebug Lite console that Outlook has appended the client name to the end of the URL. Using the setCookie function we create the “EXAMPLEToken” cookie and make it valid for 120 seconds. We then open Excel and look at an Add-In I created there. As you can see from the example below the location.href for the hosted Add-In file is https://copper.xomino.com/xomino/O365.nsf/index.html. While the path is not exactly the same as the Outlook example – the hosting domain is (copper.xomino.com). The example above uses a getCookie function to get the value of the “EXAMPLEToken” and our value “xomino365” is returned successfully. And it is as simple as that. Adding a path variable to the cookie creation has allowed us to create the cookie within on Add-In (Outlook in this case) and access it from within another Add-In (Excel in the second case). Be aware that you need to have control and consideration about how much data you load into a cookie. Any Internet Explorer cookie for a given domain cannot be more than 10234 chars. 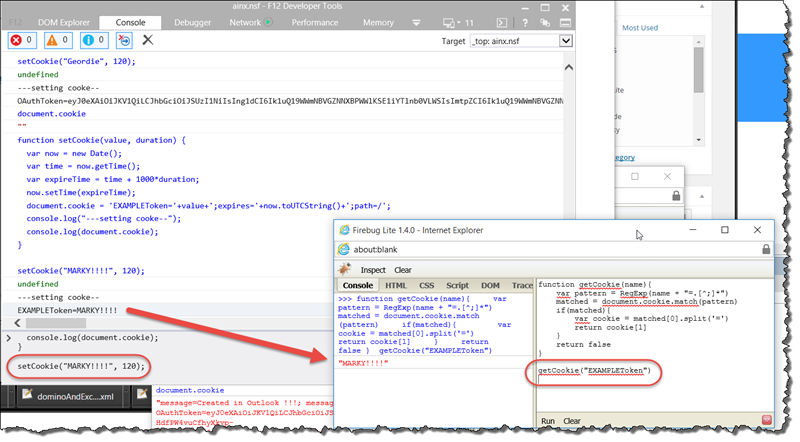 What is actually interesting to find out is that even though the embedded client Add-In used Internet Explorer – any cookies created within the client are actually available within the stand alone Internet Explorer – and Vice Versa! The cookie created in outlook before – is available in full Internet Explorer as well. In this article we will look at a technique for caching data (ultimately an OAuth token) within an Office Add-in. The only drawback so far is that every time the Add-In loads, a new window pops up to collect the token. It would be a much more elegant solution to be able to cache the token somehow and then re-use it. 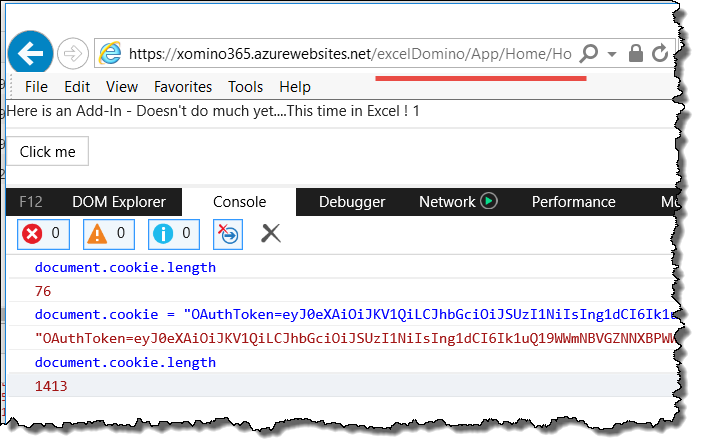 In this article we will look at using cookies for “caching” tokens in both the Outlook Client and the O365 web mail experience. Cookies have been around for almost as long as web browsers. They can be set to hold a value for a finite amount of time (permanent) or fixed to only this browser session (session). Using the FireBug Lite technique previous described we are able to take a look at cookies and how they are stored within the browser. When requesting the OAuth token for O365, the token returned is valid for 3600 seconds (an hour). So if we cache the cookie for an hour it will be a good indication (by its existence) that it is still valid. If there is no cookie – we have to get a new token. 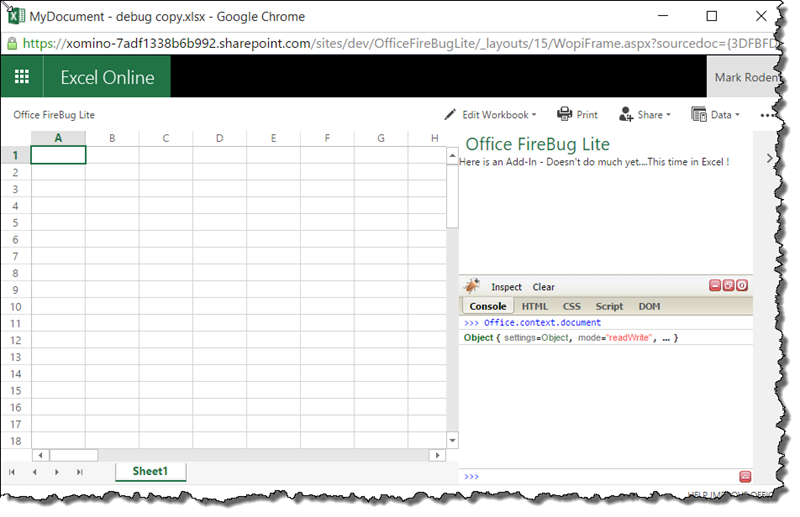 In this article I will show you how to add a web based console capability Firebug Lite to your Office Add-Ins. This is particularly helpful when debugging Client Side applications. Firebug is a Firefox plugin and was one of the original developer tools of actual use and power. It has since been superseded by all the powerful work the Chrome Dev team have put into Chrome developer tools, but I still like it (old habits die hard). This is especially helpful in the case of Client based Add-Ins. Client based Add-Ins use an embedded Internet Explorer experience and the Developer Tools are unavailable. There are ways to debug Add-Ins through Visual Studio, but seeing as I have no intention of writing a line of C#, that does not help me. 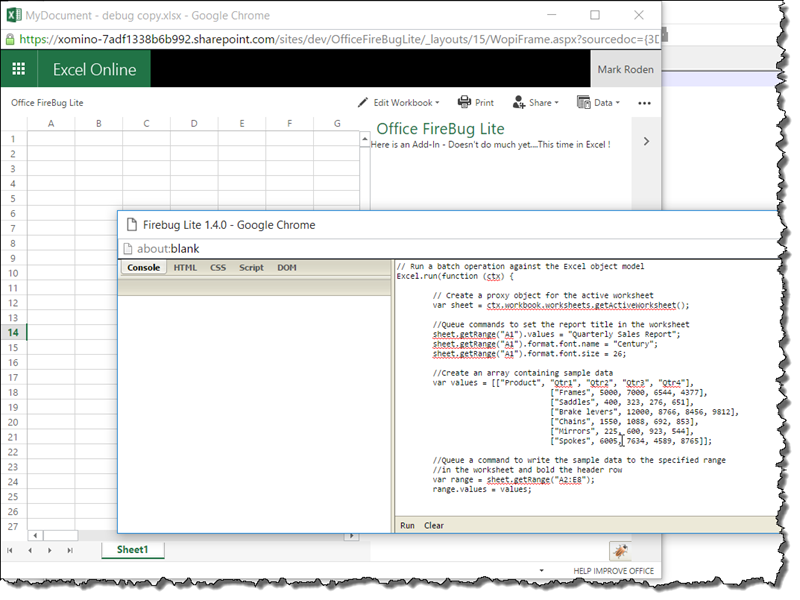 Adding Firebug Lite to your Office Add-in could not be simpler. Add the following to your application (be warned there are some issues with using it in conjunction with AngularJS). 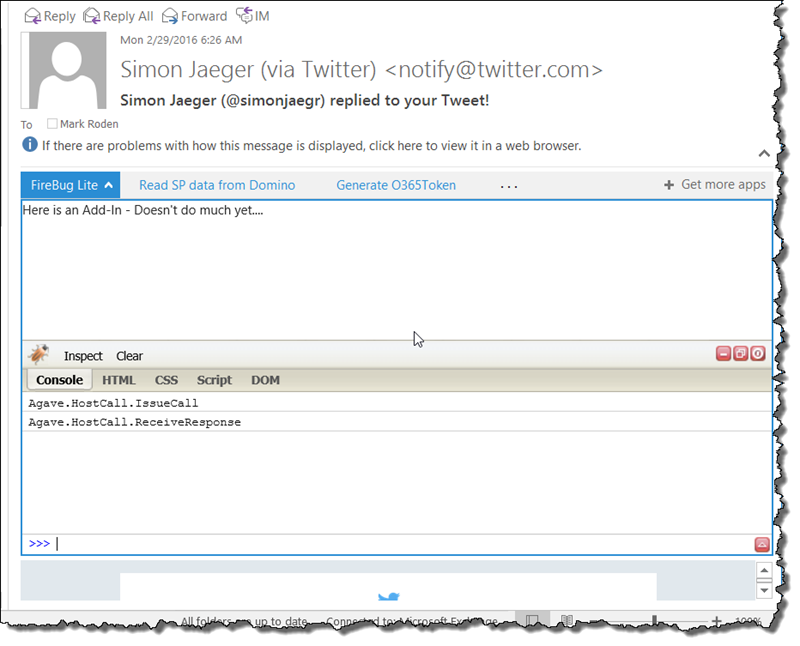 The JSON parameters are optional and not necessary if you are working in Outlook or OWA. They are necessary in the Word/Excel/PowerPoint clients though as the F12 key have an assigned function. These extra parameters open the Firebug Lite client in a new browser window. Still works, just not embedded directly inside of the Add-In. 1.3. What’s Not in Lite? I used the basic example from napacloudapp and a stripped out the HTML on the front page – this gave me the ability to still run the Office.initialize in the app.js (necessary to deploy an Office Add-In). Initializing this Office object also gives me programmatic context to the rest of the “host”, be in Outlook or Excel. Having a console inside of the Add-In gives us a significant amount of flexibility for testing and seeing what is going on. 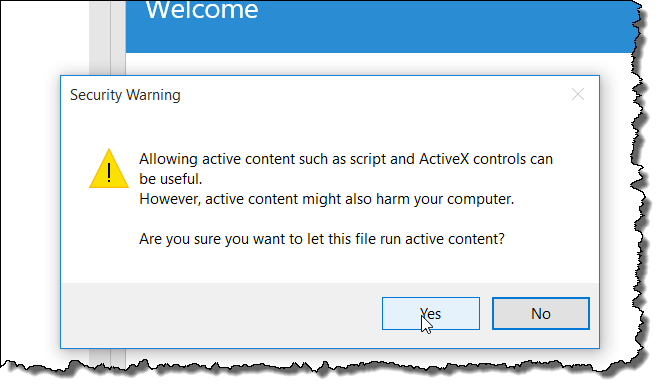 To activate it – focus on the Add-In and hit F12. If you are outside of the Add-In in the browser this will trigger the normal browser developer tools. 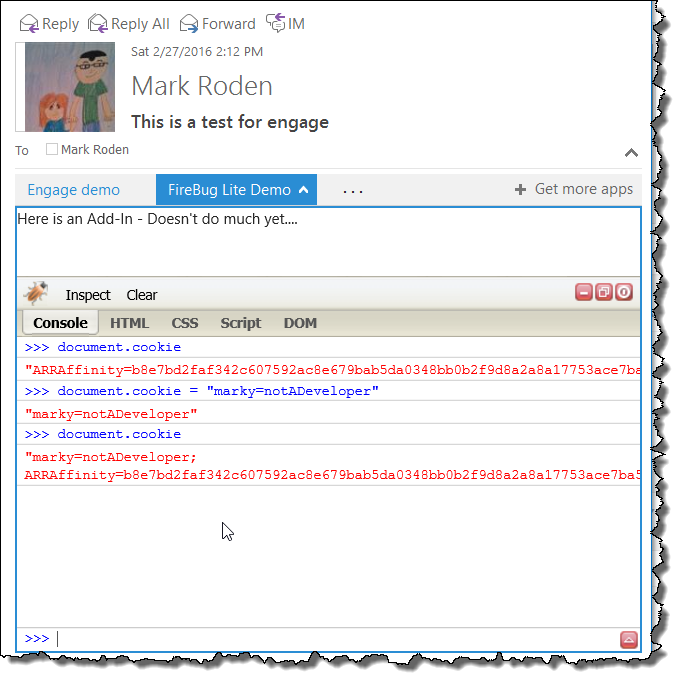 Developing Add-Ins using Firebug Lite? 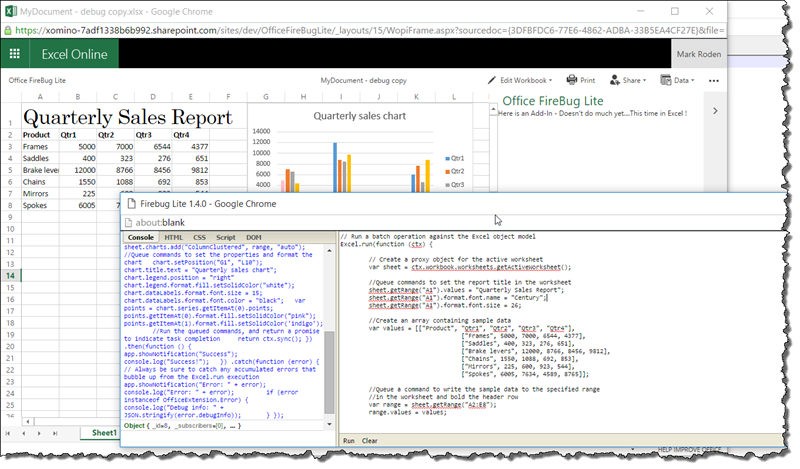 Looking at the Build your own first Excel Add-In page we can use some of their code directly inside of the Firebug Lite console. How freaking cool is that !!!!!!!! And we never had to deploy an Add-In to test that out. 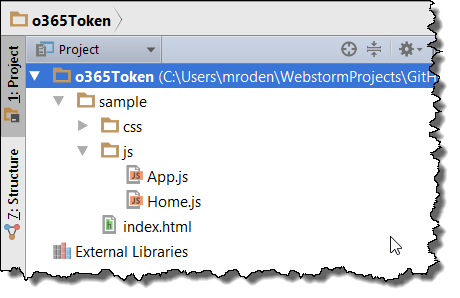 In this article I will discuss the first iteration of the new GitHub project I created for the O365Token generation. The project is a generic code sample which can be added to your Azure AD websites and ultimately used to create a secure sample Add-In. We will look at how to take the sample code in the GitHub repository and deploy it to your environment. 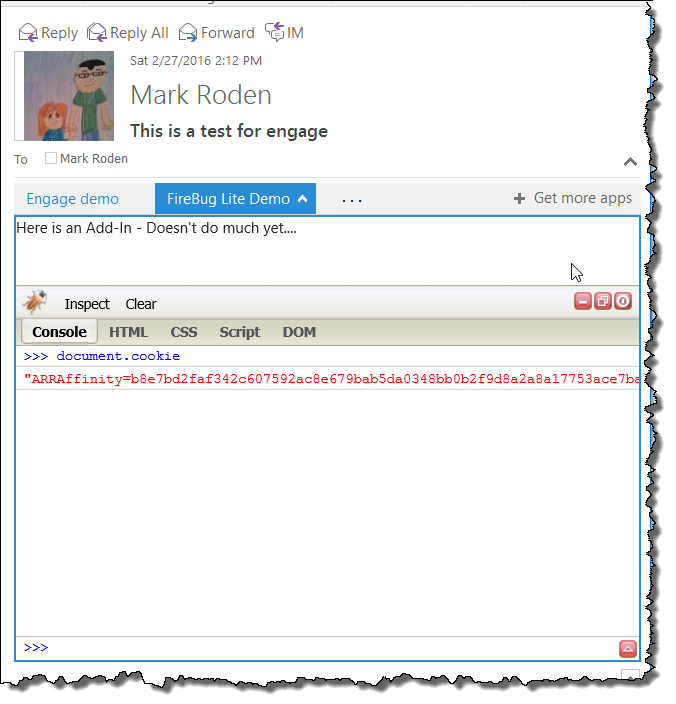 In the previous article I showed an alternate method for creating an authorization token from within the Outlook client. After receiving encouragement from Simon Jaeger I decided to continue and make this into something to hopefully collaborate on with others. @MarkyRoden I think what you're doing is interesting. You might be a stronger web developer than me (my nature is C#) so this is exciting! 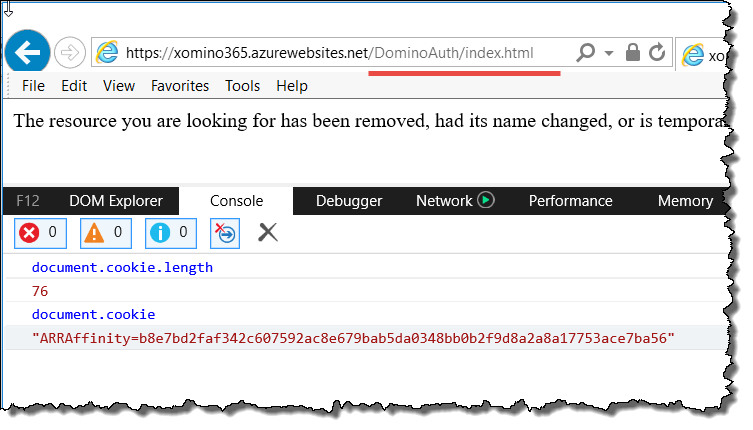 Using the instructions posted here, create your Azure AD site and make the redirect URL match the sample/index.html path. In this version of the token generation I combined a number of aspects of the code and streamlined them to work as one file. There only 3 files (not including CSS) involved in this O365Token sample. Index.html is really just the placeholder for the sample code – all that happens is that it ends up displaying the token once it is generated. We are using the same /index.html as the Add-In and the popup token generation window as well. 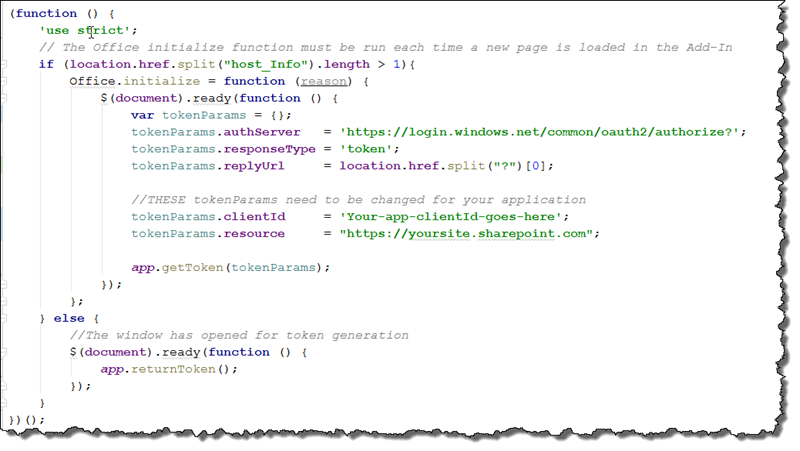 The Home.js file determines if index.html has been opened as an Add-In and if so, calls the app.getToken code. If index.html has been opened in the browser the app.returnToken is called. Called from the app.return once a Token has been generated. This is where your actual Add-In code would live in the future. I have a feeling that this ought to be an Angular module. I can see a lot of Add-In code being written as an Angular app and as such it would make sense to include the app.requestToken and app.getToken as something which can be hooked easily into any other angular app.